Physics-in-medicine major Luke Maillie returned to Tanzania this summer with a solution to the power blackout problem that he encountered last summer. In his sophomore physics seminar taught by Prof. Abigail Mechtenberg last fall, Maillie learned about low-tech power generation using gravity lights. This summer, he got to work setting up a local energy team. 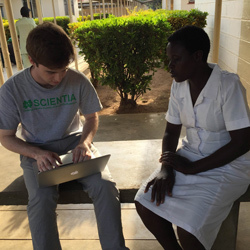 In the summer of 2015, the unimaginable challenges that arise when power is suddenly lost mid-surgery in a rural Tanzanian hospital became a stark and all too familiar reality for Luke Maillie, a Notre Dame physics-in-medicine major and international development studies minor. The desperate need, shared by an entire community, to find a low-cost, backup source of electricity during these power blackouts stuck with Maillie long after he left Tanzania to return to Notre Dame. Maillie was working at a rural hospital in Tanzania through a Kellogg Institute for International Studies Experiencing the World (ETW) Fellowship in 2015, the summer after his first year at Notre Dame, when he met the head of the non-profit organization REACH Shirati, Fred Chacha. REACH, a Berkeley-based organization that provides education, health care, and community enrichment in northern Tanzania, was in the process of building a school that would teach English to Tanzanian children, Chacha explained, but the high cost of solar panel energy and the lack of electricity for much of the community remained a looming concern. Back on campus, when Abigail Mechtenberg, an assistant teaching professor in physics, mentioned gravity lights during a lecture to his sophomore physics seminar, Maillie had a bright idea: use the low-tech power generation achieved by using the potential energy in rock weights attached to magnets and coils to illuminate the school and community. As part of the USAID’s Power Africa initiative, Mechtenberg works with people in Uganda and other African nations to implement her E3 international development focus (E3: education, engineering, and entrepreneurship), which includes providing gravity lights as a backup plan for hospitals with unreliable power. Originally published by Gene Stowe and Chontel Syfox at science.nd.edu on September 07, 2016.